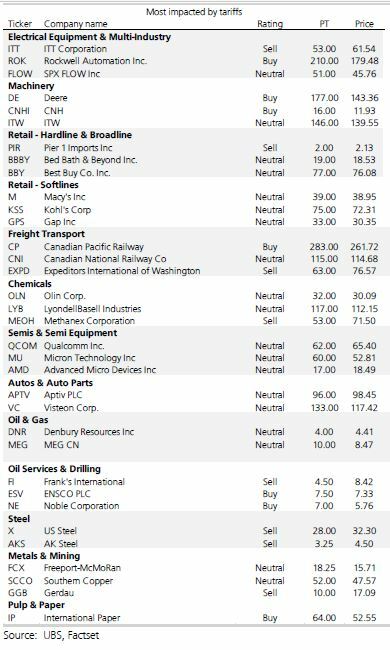 UBS analysts identified 34 stocks in their coverage universe most vulnerable to trade wars, and these stocks have trailed the S&P 500 by about 4.5 percent since March. The companies are from diverse sectors, including machinery, retail, semiconductors, energy and autos. UBS analysts say escalation of trade wars could impact earnings growth and send stock prices lower. UBS analysts said the stocks in their coverage universe most impacted by trade tensions have underperformed the S&P 500 by about 4.5 percent since trade frictions began to intensify in mid-March. They identified 34 companies from diverse sectors, including machinery, retail, semiconductors, energy and autos. Companies and industries in sectors affected could see an earnings per share hit more than double the impact on the overall S&P 500 if trade tensions worsen. The full brunt of trade escalation is not priced in, they said in a note released earlier this week. The analysts said the hardest-hit semiconductor companies would include Qualcomm and Micron, because they have the most direct revenue exposure to China. About 65 percent of Qualcomm's revenue is from China and Micron's is just over 50 percent. In retail, companies that import higher amounts of goods from China would be more adversely affected. For instance home furnishings sellers import anywhere from 30 percent to 70 percent of their products from China, so Pier 1 is on the list. Consumer electronics retailers source an estimated 50 percent to 60 percent of their merchandise from China, and that affects Best Buy. Companies affected by tariffs on agriculture also made the list and that includes Deere.